Turkey's Supreme Election Council (YSK) declared Wednesday it will not award the certificate of election to the elected mayors who were previously dismissed by a decree issued during the state of emergency due to their affiliation with a terrorist group. In a meeting, the members of the council decided by unanimous vote to not to allow elected mayors dismissed under the decree law to take office, while deciding with the majority of the votes to award mayoral candidates in second place, instead. The decision affects six mayors to be from the Peoples' Democratic Party (HDP) in the districts of Van's Edremit, Çaldıran and Tuşba, Diyarbakır's Bağlar, Erzurum's Tekman and Dağpınar township of Digor district of Kars. 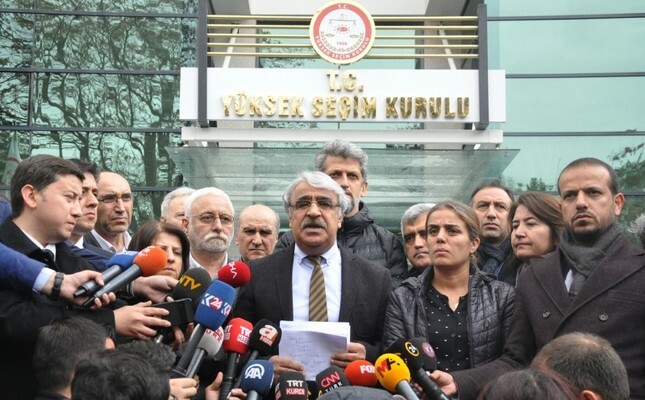 The decision came after Hüseyin Beyoğlu, Diyarbakır's Bağlar district candidate of the ruling Justice and Development Party (AK Party), pointed out relevant laws and decree laws saying that those dismissed or suspended by a decree law cannot serve as public officials in the future regardless of the imprisonment sentence. Following Beyoğlu's statements, the AK Party moved the objection to the YSK. Criticizing the YSK decision, HDP spokesman Saruhan Oluç said they do not approve the decision and claimed that the YSK was being used as a political tool. He stressed that there was no obstacle for the candidates dismissed by a decree law when they were elected as mayoral candidates, Oluç said the "The YSK could have issued a circular [before the election] and say that people within the scope of decree laws are ineligible to become a mayoral candidate." Decree-laws are a part of the state of emergency declared on July 20, 2016, following a deadly coup attempt by the Gülenist Terror Group (FETÖ). More than 130,000 public officials, many holding positions in the government and military, have been dismissed or suspended from their positions on the grounds of suspected involvement in the coup bid, affiliation with a terrorist organization and for posing a continuous threat. According to these decree laws, persons who were dismissed from the public office directly or indirectly cannot assume public offices, cannot be readmitted to the institution they served and cannot be employed in public services, regardless of the presence of any conviction. Several public servants were also dismissed due to their affiliations with other terrorist organizations, including the PKK. The PKK resumed its decades-old campaign in July 2015 after a three-year cease-fire collapsed. Since then more than 1,200 people, including security personnel and civilians, have lost their lives in PKK attacks. During the process, some HDP municipalities directly or indirectly supported these violent terrorist activities. As a result, Turkey removed the elected administrations of 94 municipalities in the region for their links to the PKK terrorist group and appointed trustees to these municipalities in 2016. The new administrations' trustees have been welcomed by locals as they have brought new services and cut the money flow to the group. In the trustee-run municipalities, damaged infrastructure for drinking water, wastewater and sanitation has been repaired and new infrastructure has been built.